When people ask me what is the most beautiful place I’ve ever visited, Patagonia is the first place that comes to mind. My trip to Ladakh, India is also up there, and so are the Faroe Islands. But for me, Patagonia travel ultimately has to be the winner. But when you search for Patagonia on Google, it’s the famous clothing company that dominates the results. 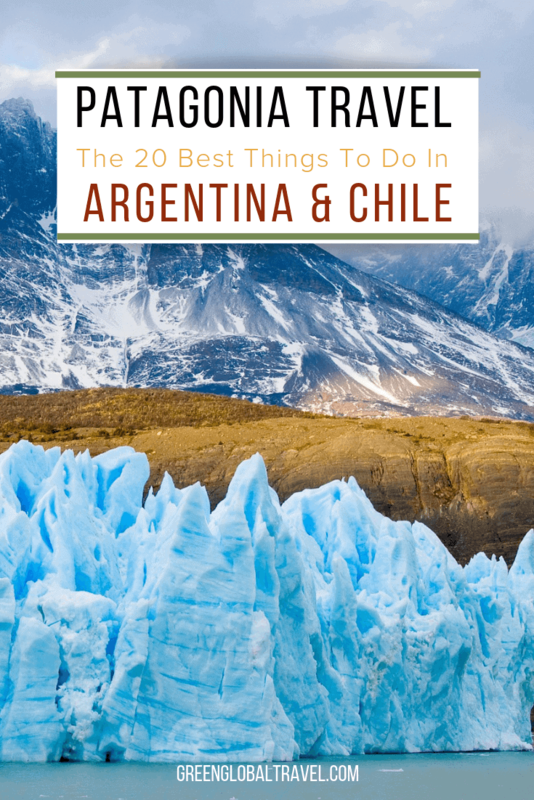 Patagonia, South America– which encompasses significant portions of Argentina and Chile– doesn’t even show up until you get more than halfway down the second page! Which is a shame, because the southernmost tip of South America is truly stunning. Taking a Patagonia trip reveals a sparsely populated land of seemingly impregnable granite mountains, pristine greenish-blue lakes, and mighty glaciers that will make your jaw drop with their sheer size and beauty. There are tons of things to do in Patagonia, which is world-renowned as a haven for outdoor adventurers like us. But thankfully, the region has yet to fall victim to the rise in mass tourism. If you love hiking, simply walk out of any town or village and you’ll likely find yourself in overwhelmingly gorgeous surroundings. Or you can head to Torres del Paine National Park, in Chilean Patagonia. There you can hike the 4-day long W Trail, which provides exceptional views of Grey Glacier. The options for incredible Patagonia tours are endless. There’s rock climbing in the majestic mountains, viewing endemic wildlife such as Guanacos and Andean Condors, glacier hiking, exploring caves, and much more. In short, Patagonia truly is a place that you will never forget. Patagonia is not a country, but a region in the southernmost part of South America. It encompasses approximately 1,043,076 square kilometers, or 402,734 square miles, in Argentina and Chile. This area includes the southern Andes mountains, deserts, pampas and grasslands, and coastal areas. It is bordered on three sides by the Atlantic, Pacific, and Southern oceans. Different people define Patagonia’s location in different ways. 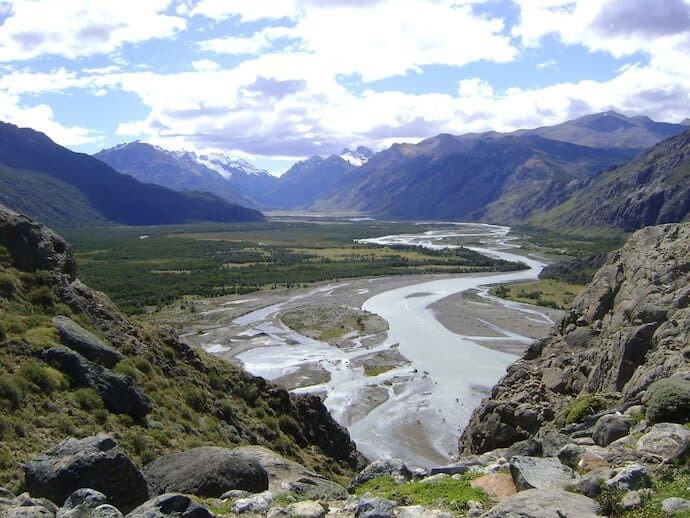 Most people consider the Colorado and Barrancas rivers the northern border of Argentine Patagonia, and the Huincul Fault the northern border of Chilean Patagonia. Some geographers include the southern archipelago of Tierra del Fuego as part of Patagonia, while others limit it to the mainland. How do you get to Patagonia? The simplest way to get to Patagonia is to fly into Buenos Aires, Argentina or Santiago, Chile. From there you may need to take a domestic flight into Punta Arenas or Puerto Natales, from which many organized Patagonia tours depart. Be aware that December to February is peak season, so you’ll want to book your flights at least 3 months in adance. Adventurous travelers may prefer to rent a car and take a Patagonia road trip, in order to stop and see the stunning sights along the way. What’s the best time to visit Patagonia? Patagonia is located in the Southern Hemisphere, so the region experiences winter in what you may think of as summer months (May to August) and summer in what you consider winter (December to March). Winters there are often brutally cold and windy, with up to 17 inches of rain/snow per month in some places. So it’s best to visit Patagonia in their summer, when it’s much warmer and drier. Is Patagonia a safe place to travel? Patagonia travel is safe in every possible way. Remember, this area is extremely remote and almost shockingly unpopulated. Patagonia’s population is less than 2 million, or about 5 people per square mile. From Patagonian deserts and mountains to glaciers that stretch for miles, this is a region of wide open spaces and very little of the crime that has plagued other parts of Latin America. In fact, Lonely Planet described it as one of the safest tourist destinations on Earth! 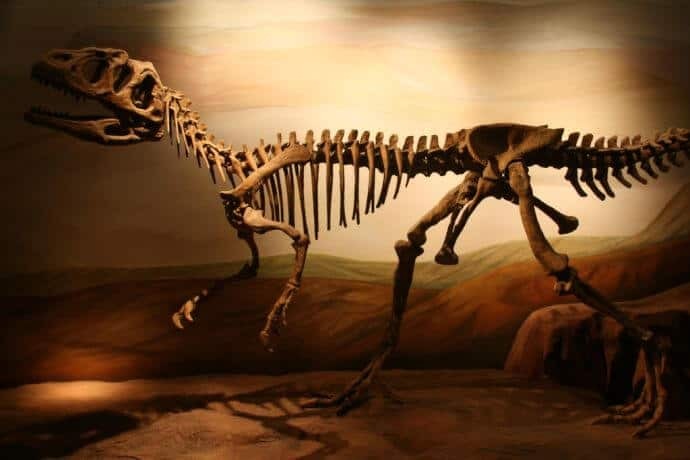 Located in the city of Trelew, the Egidio Feruglio Paleontology Museum does not enjoy the fame of other Argentina tourist attractions, like the Perito Moreno glacier or the majestic Iguazu waterfall. In fact, most Argentina visitors have never heard of it. But those who do visit are often amazed at what they find. Its main exhibit is a journey backwards in time, starting 10,000 years ago, when the first human settlements appeared in the area. It continues through the Cretaceous, Jurassic, Triassic and other periods, with fossils of land and marine animals that lived during each period on display. The Mesozoic Hall, which is filled with the giant dinosaurs who once roamed Patagonia, is the most awe-inspiring section. You can continue this journey through time all the way back to the start of the universe with the Big Bang, which is explained through a film shown in a small theater. But the Egidio Feruglio complex is much more than a museum. It’s also an important science research center. There’s a window that allows museum visitors to peek into the laboratory where paleontologists study the fossils. 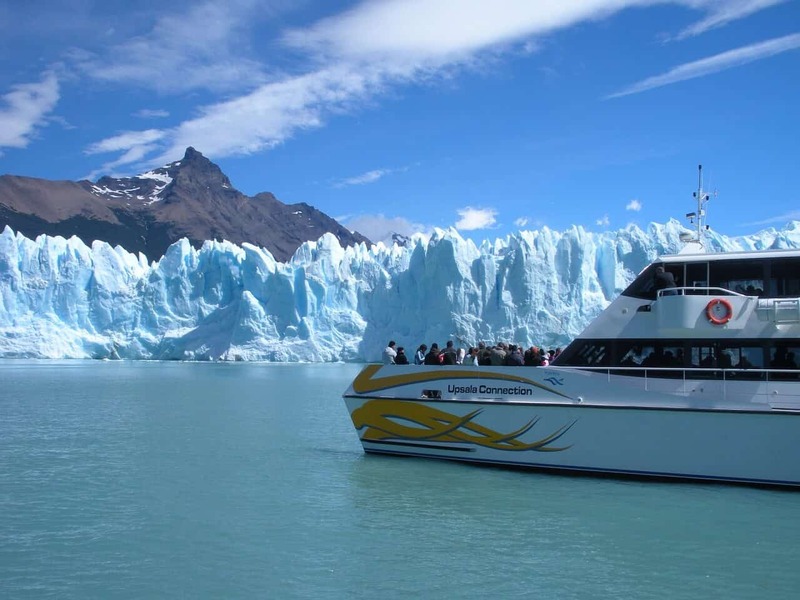 Taking a glacier cruise on Lago Argentino is sure to be a highlight of any trip to Patagonia. The boat passes oddly-shaped, bright blue icebergs on its way to the first stop, Upsala Glacier. At 10 kilometers wide, Upsala is the largest glacier in all of South America. The boats don’t usually get too close, as the entire face of the glacier often calves (a.k.a. falls off) at the same time, creating an enormous– and dangerous– surge. Instead, you can soak in the panoramic view of the glacier from a safe distance. The boat does stop close by one of the huge icebergs that resulted from this calving, and there are opportunities for photos with a bright blue iceberg behind you. The crew then chips off a large chunk of ice and chops it into ice cubes for drinks. 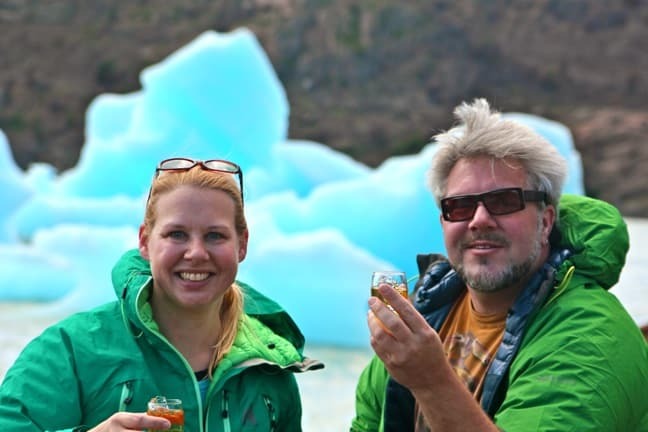 So you can have a Scotch or Pisco Sour with an ice cube that is hundreds of years old. The boat then sails to Spegazzini Glacier, which is smaller but much more stable, so you can get very close to its face. As you sail slowly past, the cliff of blue ice towers far above. 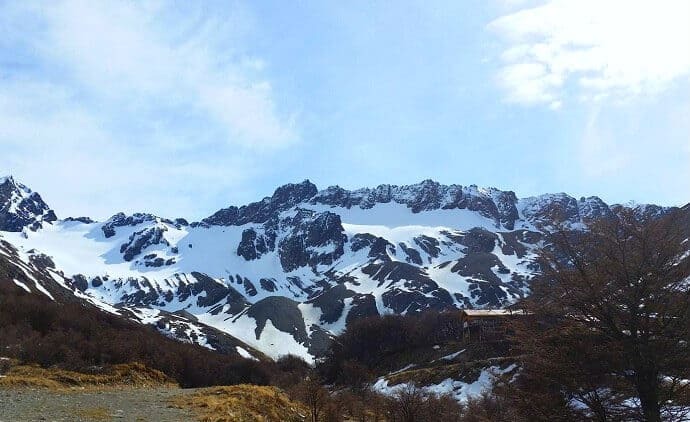 The area of Bariloche offers many incredible trails and viewpoints, and you can find both in Llao Llao Municipal Park. One of the best hiking trails to take in the park is called Cerro Llao Llao. This relatively short and easy hike includes walking mostly on flat surfaces and climbing for 20 minutes to the Cerro Llao Llao viewpoint. 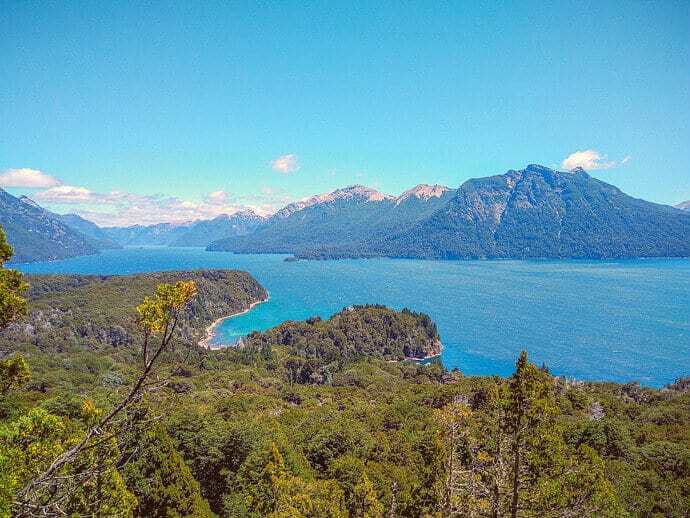 Not only does this unique spot offer breathtaking views over Llao Llao Municipal Park and Nahuel Huapi National Park, but it’s also a lot less touristy than some of the other scenic viewpoints in this area. From here, you can either go back or continue your hike towards Villa Tacul, a quiet and secluded beach with crystal clear water. 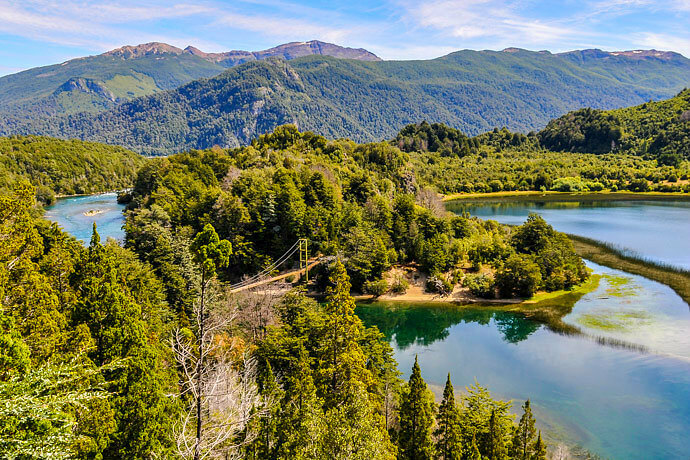 For those who love cycling, you can also take the Circuito Chico trail, which is a 60-kilometer route that passes through the park and several other spots in the outskirts of Bariloche. If you’re inexperienced or just want some company, this trail can also be explored with an organized biking tour. Los Alerces National Park (Parque Nacional de los Alerces) is one of the most beautiful and underrated national parks in Patagonia. It’s located in Argentina’s Province of Chubut. The main feature of the park (which also gives its name) is the alerce, a large evergreen tree that can live for a very long time. One of the oldest trees you can see, “El Abuelo” (grandfather), is 2,600 years old. Hiking in the national park is a wonderful experience. There are several beautiful lakes to see, such as the large Lake Futalaufquen and Cisne Lake, Menendez Lake, and (our favorite) the small Green Lake. All these lakes are interconnected through river systems such as the Los Arrayanes River. There are great viewpoints in the park from where you can contemplate some of the glaciers in the surrounding mountains. There are quite a few self-guided paths in the park with signs that tell you a lot of information about the flora and fauna in the area. You can also combine walks with boat excursions. The best way to get to the park is to take the official bus from Esquel. Most travelers skip this national park in Patagonia, since it lacks the awesome landmarks such as the Perito Moreno Glacier or the peaks around Chaltén. If you’re visiting Patagonia between June and October, one of the most high-octane things you can do is to go skiing. And what outdoor adventure could be more adrenaline-pumping than skiing down a glacier? Martial Glacier is a popular Argentina tourist attraction all year round, drawing dozens of enthusiastic hikers almost every day. Even in the warmer months, the glacier is still a delight to witness. So are the spectacular views from atop the glacier, looking out over the surrounding Tierra del Fuego archipelago. The glacier itself lies at the very top of a ski resort, so it’s essentially the starting point for some advanced ski slopes. There are 2 main slopes that run back down from the top of the ski lift. They are both south-facing, and the downhill winds often make these runs cold, yet exhilarating. The main run is roughly 30 meters wide, but you’ll also find possible backcountry, off-piste skiing opportunities. However, these should really only be attempted with a guide. Either way, the entire experience of being at Martial Glacier is incredible, and skiing it makes for an unforgettable trip! Monte Tronador is located on the border between Chile and Argentina in an area known as the Patagonian Lake District. The starting point for the trek into the mountains is from the ski resort town of Bariloche, in Argentina. In the summer months the skiing is replaced by hiking on well-marked trails, which can be picked up just a few kilometres out of the town. The trek to Monte Tronador leaves from the Pampa Linda guest house. If the full-day trek to Glacier Alerce and Refugio Otto Meiling is too far for your liking, there’s an option to go horseback riding for the first part of the trek. The path winds through dense woodland before breaking out of the tree line. From here the path is clear but rugged, and the end goal of Monte Tronador can be seen ahead. The trek takes a minimum of five hours ,and a one-night stay in the mountain hut is the easiest way to complete the trek safely. If you’re going to do just one thing in Argentina, make it a visit to Perito Moreno. 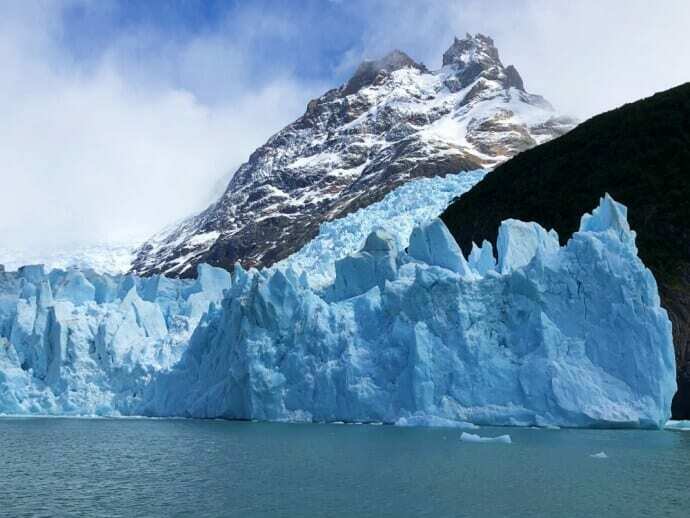 It’s the most famous Patagonia glacier, and one of the most popular Argentina tourist attractions. Standing in front of the glacier, watching chunks of massive blue ice fall into the waters of the lake below was an experience that literally moved me to tears. It was one of those times when I experienced the force of nature at its most powerful, mighty, and resilient. Perito Moreno is one of the few ice fields that has withstood global warming. As a result, it is not retreating, it’s actually advancing. Glaciers are dynamic entities, pushing their way through the mountains. Calving (ice falling into the lake) is a totally normal phenomenon. When it comes to watching wildlife, not many people think of heading to Argentina. But Patagonia is teeming with wildlife, both on land and in the sea. And for a lot of the best animal encounters, there’s no need to join expensive package tours because it’s easy to manage do-it-yourself itineraries in the area. For a memorable marine experience, head to the Reserva Loberia de Punta Loma, the provincial reserve located less than 10 miles southeast of Puerto Madryn. It’s an easy drive for doing a Patagonia road trip, or a quick 30-minute taxi ride from the city. 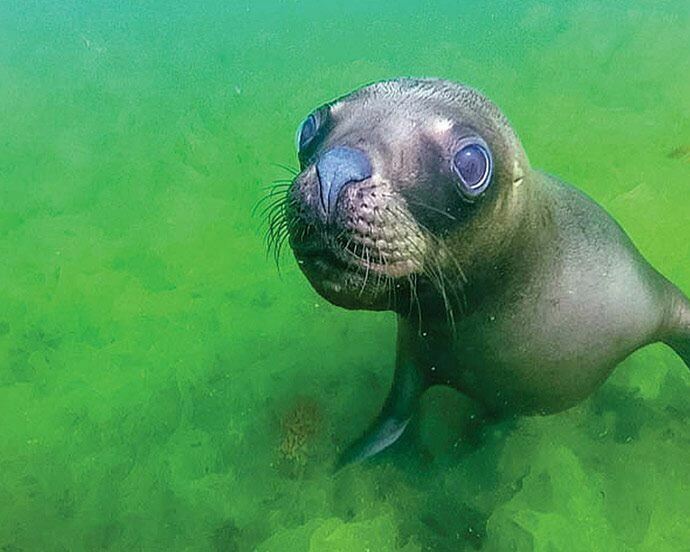 From the point, it’s possible to see lots of sea lions playing in the waters of Golfo Nuevo or lounging on the shore. But for a truly immersive experience, why not snorkel with these playful, curious creatures? If you travel to Patagonia, you simply can’t miss the opportunity to do a glacier hike. And while Viedma may not be as well-known as the nearby El Chalten, it’s still well worth a visit. Perito Moreno is the most famous glacier in Patagonia, but hiking it tends to be a bit pricey and quite crowded. Viedma is honestly just as spectacular to see as Perito Moreno, but with only a handful of tourists around. 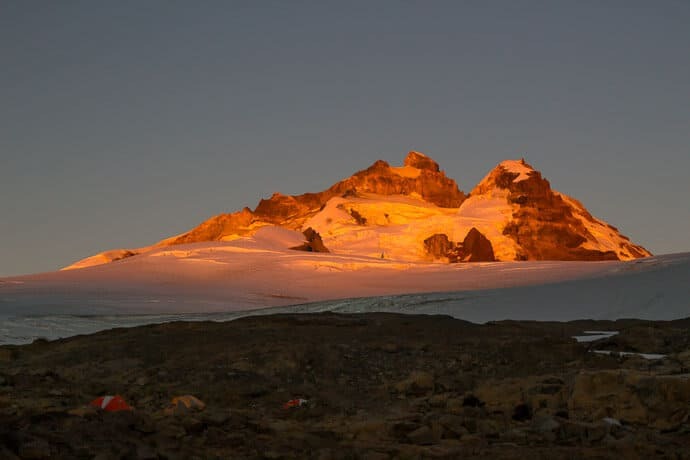 Once you arrive at Viedma, you’ll strap your crampons on, grab a harness and an ice axe, and follow your guides as they make their way up the glacier’s edge, around deep-blue crevasses and pinnacles. If Torres del Paine is the hiking capital of Chilean Patagonia (and it is), then El Chalten is the go-to place on the Argentinian side. Everything around El Chalten seems to cater to adventure travelers, with loads of hiking maps, shops selling mountaineering and camping gear, and several hotels with spas to relax those weary limbs. We recommend two hikes specifically. The first one is Laguna de los Tres, a day-long hike weaving down a valley and then up to the laguna, where it’s possible to enjoy a great view of Cerro Fitzroy, one of the iconic Patagonian mountains. The hike is fairly strenuous, but doable by just about anyone with a reasonable fitness level. The trail is popular and well marked. If you get thirsty, you can just fill your water bottle at one of the many streams running parallel to the trail. Peninsula Valdes is the main sight on the Atlantic side of Argentinian Patagonia, and it is truly a must-see for wildlife lovers. 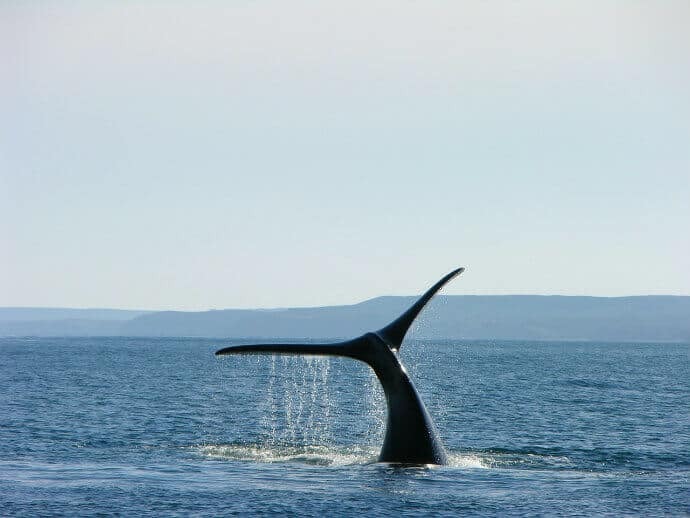 Between May and November, the coastal area off Puerto Madryn is a breeding ground for Southern right whales, and seeing these endangered whales is practically guaranteed. Orcas also travel these waters, and often get right up onto the shore in order to hunt for sea lions and seals on the beach. It’s a spectacular sight that you may be lucky enough to experience on a whale-watching tour of the area. Punta Tombo– a narrow rocky strip on Argentina’s central coastline that stretches around 2.2 miles (3.5 kilometers) into the sea– is home to the largest colony of Magellanic penguins in all of Latin America. The beaches are wide with a gentle slope and lots of shrubs and burrows, which makes it an ideal place for penguins to make their nests. 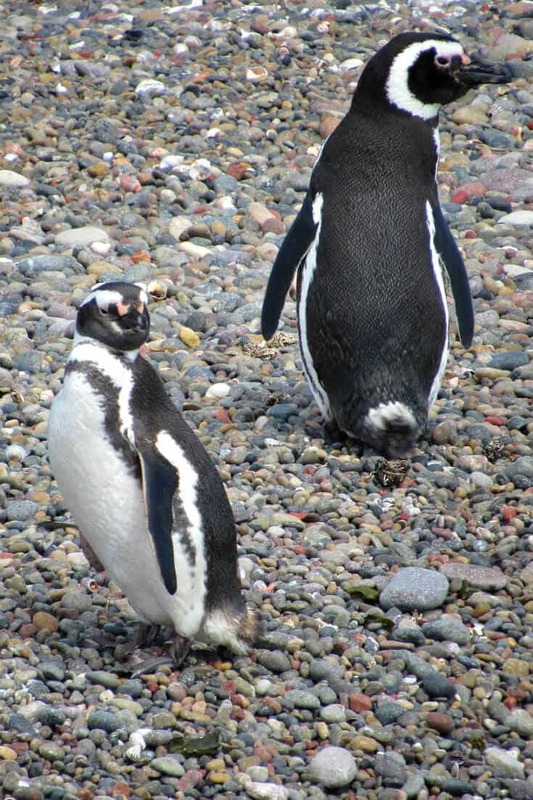 This explains why there are so many penguins here– around 500,000 mating pairs– and why Punta Tambo was declared a protected wildlife conservation area in 1979. You can visit Punta Tombo and walk amongst the penguins on trails and boardwalks, which is one of the most memorable things to do in Patagonia. You can’t help but being charmed by their personalities, which are curious, but quite shy. They look up to study you, tilting their heads from one side to the other as they take you in. It’s absolutely adorable! Magellanic penguins are only around two feet tall, which is about half the height of their King and Emperor penguin cousins in Antarctica. 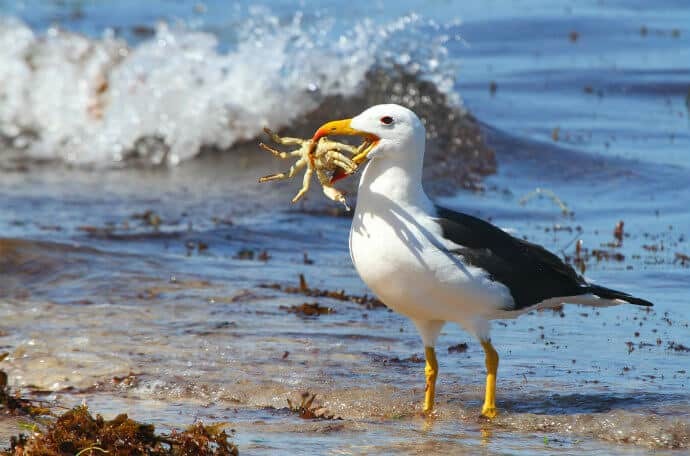 They gather in Punta Tombo from mid-September to mid-April to nest, mate, breed, and moult (shed their feathers). If you’re an intrepid adventurer who has made it all the way to Ushuaia, Argentina, you won’t want to miss the opportunity to explore the famous Beagle Channel. The town is aptly called El Fin del Mundo, or the end of the world, because it is the southernmost city on the planet. You can explore the Beagle Channel by getting on a boat and sailing into the open water, just as Charles Darwin did on his ship the HMS Beagle, for which the channel is named. Beagle Channel boat tours leave the docks in Ushuaia, sail past the historic Les Eclaireurs Lighthouse, and travel in and around some of the local islands. 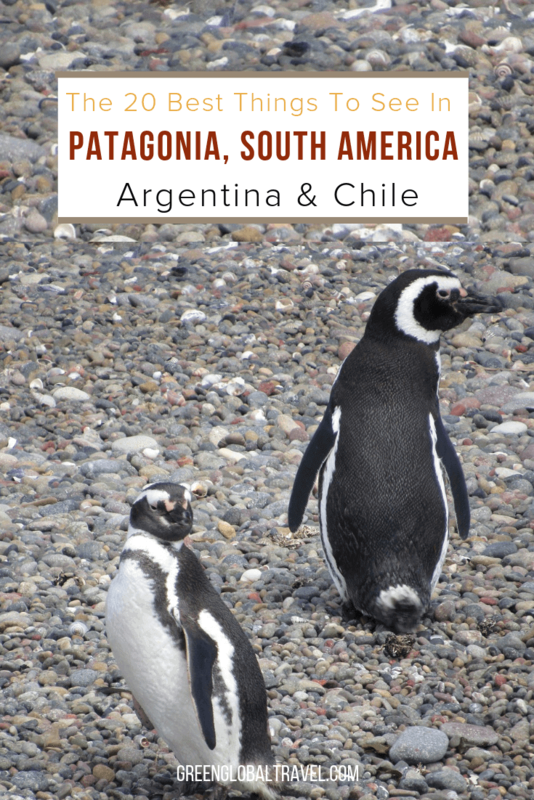 Along the way, you’ll have the chance to see many different types of wildlife, including the sea lions at Sea Lion Island, colonies of black and white cormorants, giant albatross, and– depending on the timing of your trip– even a colony of Patagonian penguins! Some boat tours also include time for a mini-trek on one of the Beagle Channel islands, which is a great way to learn more about the plants and less-visible types of Patagonia wildlife. The southernmost Argentina tourist attraction is the islands of the Tierra del Fuego, beyond which there is only Antarctica. 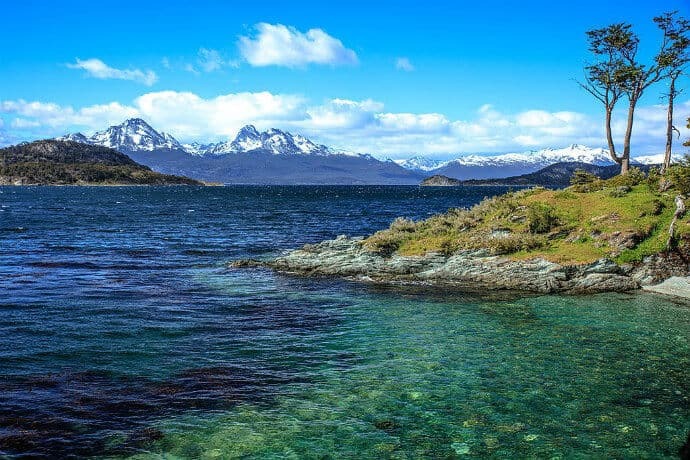 Located across the Strait of Magellan, the archipelago is divided fairly equally: Argentina controls the eastern half of Isla Grande de Tierra del Fuego, while Chile controls the western half as well as the islands located south of the Beagle Channel. These “islands of fire” have been inhabited for at least 10,000 years, and were named after the fires of natives spotted from the sea during Ferdinand Magellan’s 1520 expedition. These indigenous people were ultimately displaced during the Patagionian sheep farming boom of the late 19th century. Today, Tierra del Fuego remains a wild, windswept land, with dwarf lenga forests and some plants that don’t exist anywhere else on Earth. It includes the true southern tip of South America, Cape Horn, which can be isited on a 3-day cruise out of Ushuaia (where most Antarctica cruises depart). You’ll be surprised by the amount of things to do in Ushuaia, the town at the end of the world. One of the most interesting is a visit to the Museo Maritimo y del Presidio, or Maritime Museum and Old Prison complex. The prison is modeled after Port Arthur Prison in Tasmania, Australia. 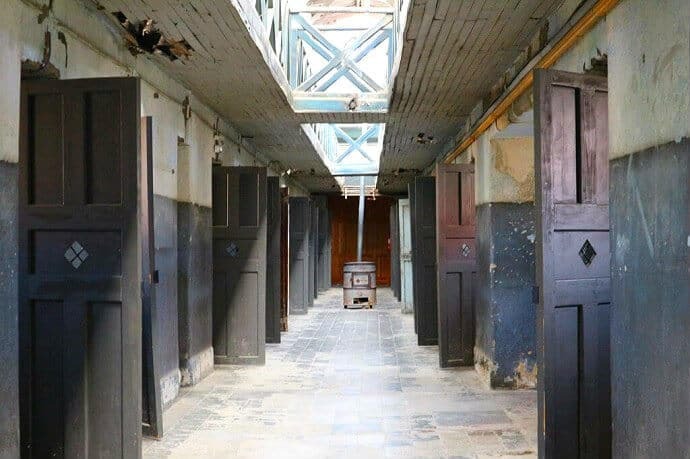 This is where the most brutal criminal offenders in Argentina went to live out their sentences, away from the general population. The prison was constructed in 1846 with almost 300 cells, and closed in 1947 amid widespread rumors of prisoner abuse. The prisoners were put to work creating infrastructure, including a popular tourist attraction known as the Train at the End of the World, which runs through Tierra del Fuego National Park (another Ushuaia-area gem). Today the attraction recreates what conditions were like during the prison’s existence. History buffs will enjoy the stories and scandals from this distant, isolated region in the 1800s, with wax figurines helping to tell the tale. The Museo Maritimo part of the complex houses ship models, antique maps, and maritime artifacts. The exhibits tell the story of early explorers like Ferdinand Magellan, who navigated these waters while seeking routes between the oceans and researching the area. There is also an exhibit dedicated to penguins and, more incongruously, a doll museum. The Ruta 40 stretches through Argentina, over 3000 miles from the Bolivian border at la Quiaca to Rio Gallegos in the Santa Cruz province. It travels all across Argentine Patagonia, including the mountain and lake paradises of Bariloche and El Bolson and the Perito Moreno. The Ruta 40 isn’t the quickest way to travel the region: it’s a long and winding road, most of which is unpaved. But it offers beautiful Patagonia mountain views and a true feel of adventure along the way. 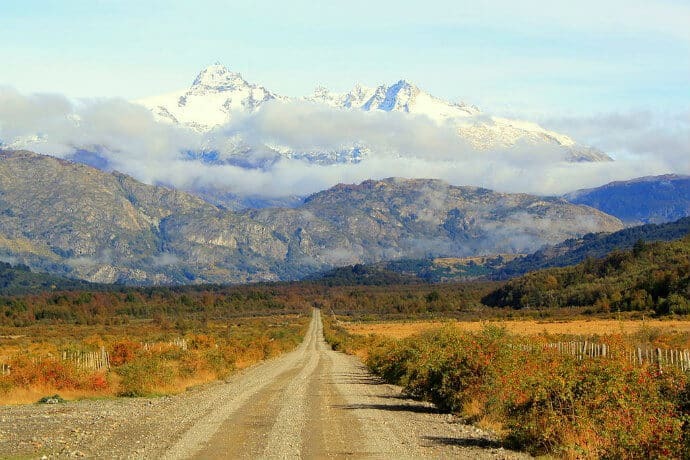 The Chilean Patagonia counterpart is the Carretera Austral, an incredibly scenic road that runs 770 miles from Puerto Montt to Villa O’Higgins. This road was built by Pinochet in order to connect remote communities, and travels through thick forests, past fjords, glaciers, and mountains. Chilean Patagonia is an amazing region for hiking enthusiasts, with dozens of multi-day trekking routes and hundreds of day hiking trails offering incredible scenery. Cerro Castillo National Reserve is off the beaten tourist path compared to more famous places like El Chalten or Torres del Paine. As a result, there are significantly less people there. 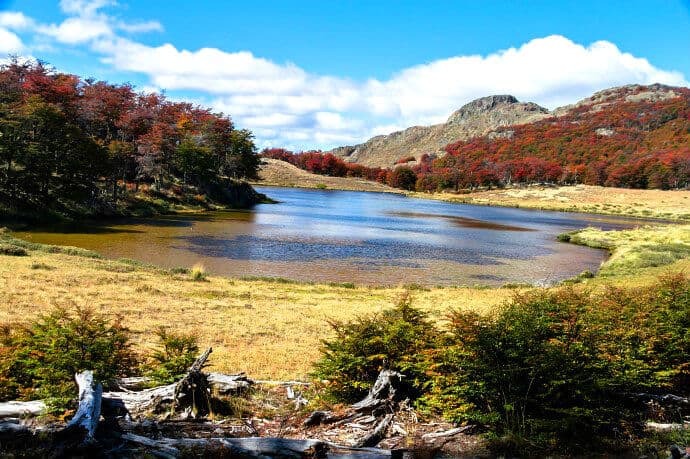 The reserve offers two hiking routes– a day hike to Laguna Cerro Castillo, and a 4-day trek through a large portion of the park. Both routes are well-marked and relatively easy to follow. The day hike starts and ends in Cerro Castillo village. It’s a 7.5-mile (12-kilometer) return route that takes hikers 2952 feet (900 meters) up to the Mirador Cerro Castillo, then back down to the village. Depending on your hiking pace, it takes about 7-8 hours to complete the round-trip hike. The multi-day trek is 31 miles (50 kilometers), so you’ll need four to five days to complete it. This is an unguided hike of moderate difficulty, starting at Las Horquetas and ending at Villa Cerro Castillo. The reserve itself has very little infrastructure. There are four established campsites with basic facilities– no shops, restaurants, or accommodations whatsoever inside. So those who decide to do the multi-day hike will have to bring their own camping gear and food. 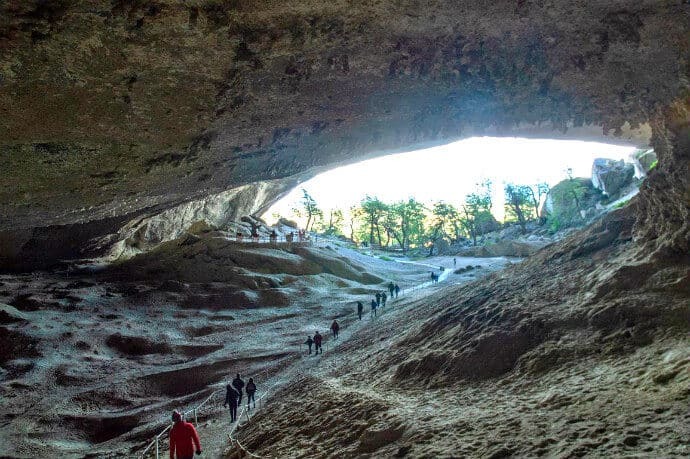 If hiking in Patagonia is not your thing, or you’re tired after finishing your W-trek in Torres del Paine, the Milodon Caves near Puerto Natales offers a great opportunity for a half-day trip full of history. The Milodon Caves is an active archaeological site, with new finds occurring fairly regularly as the excavation of the site progresses (mostly ancient tools, firewood, and animal bones). There is one bigger and 2 smaller caves, all of which were formed by erosion of a glacier at the end of the Ice Age. In the late 19th century, the 10,000-years-old remains of a Giant Sloth (a.k.a. the Milodon) were found here. Evidence suggest that these caves were also inhabited by humans later on. The area around the Milodon Caves is yet another gem of Patagonia Chile. All three caves are connected by a short walk, and there is a lookout point at the top of the largest cave. So everywhere you walk, you get a wonderful view on the surrounding peaks. A scattering of Guanaco graze on the pampa grassland in front of the park’s visitor’s centre. Occasionally a ñandu (a.k.a. Rhea, a relative of the Octrich and Emu) shuffles into view. If you glance at the sky above, you might well spy an Andean Condor. On the trails that wind through thickets of southern beech that blush red in fall roams the king of Patagonia, the powerful Puma. 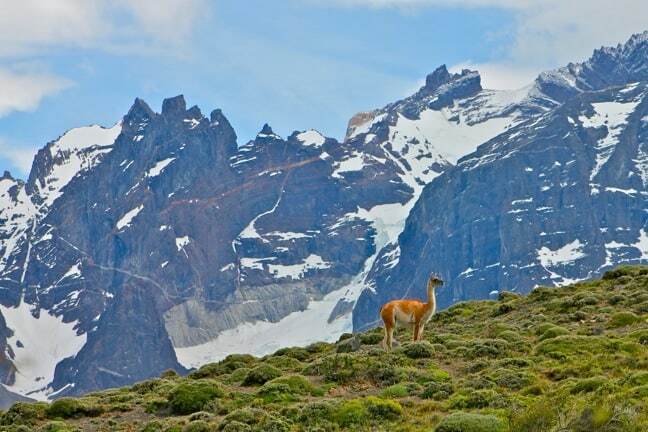 Parque Nacional Patagonia is one of Patagonian Chile’s newest national parks. It was opened in 2018 as part of the epic land donation by Kristine Tompkins (the widow of North Face founder Doug Tompkins). Lying south of Coyhaique on a stretch of the Carretera Austral that is infrequently visited by tourists, the park promises dazzling landscapes that have been “rewilded” back to their natural state. There’s also well-considered infrastructure, including campgrounds, a restaurant, and a luxury lodge. In the center of the park (known as Valle Chacabuco) there are five hiking trails. 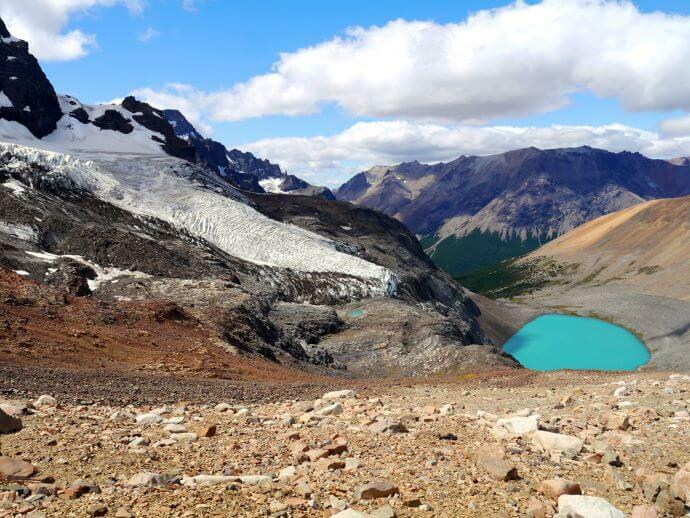 These range from short day hikes to longer routes such as the Lagunas Altas, which passes between lakes of glacial hues. Torres del Paine arguably offers the best hiking in Patagonia, and easily ranks among the best tourist attractions in Chile. The most famous trail here is the W, which is named after its shape, as it weaves in and out of valleys that allow you to get close to glaciers and mountains. The highlights of the national park include Grey Glacier, Valle Francés, and the granite peaks of the Torres del Paine massif, which can be reached on foot after a strenuous ascent on a sandy moraine. Most people just hike the W when visiting the national park, even though there’s many more things to do in Torres del Paine. You can hike the Fauna Trail (which provides close-up views of Chilean wildlife such as Guanacos and Andean Condors), visit the prehistoric Milodon Cave, and go canoeing or kayaking in one of the park’s numerous glacial lakes.